BEREA, Ohio (AP) Joel Bitonio’s sliding only a few feet to his left, but it’s a seismic shift for him – and the Browns. Less than one week into Cleveland’s training camp, coach Hue Jackson moved Bitonio from left guard to starting left tackle, a spot vacated when 10-time Pro Bowler Joe Thomas retired in March. Well, the Browns went through the alphabet in a flash. ”I’m going to put the best five players out there,” Jackson said following Wednesday’s practice. ”We know he’s one of the best left guards in football. He has the versatility to go out there and play, and me knowing Joel, he’s a team guy. I had a really good conversation with him, we’re going to do everything we can to continue to address that position. Cleveland’s initial plan was to bring Shon Coleman, who started 16 games at right tackle last season, to the left side. However, the former third-round pick has struggled so far in camp and Jackson decided he couldn’t wait any longer to see if Coleman would improve. Another option was Greg Robinson, a former No. 2 overall draft pick. But he’s out with a concussion and there’s no timetable on when he’ll be back. So after talking things over with his staff, Jackson approached Bitonio, who told his coach he do whatever was best for the Browns. Bitonio’s spot will be taken by rookie Austin Corbett, who got a brief look at left tackle in camp. ”He’s our next-best guard on our team,” Jackson said. 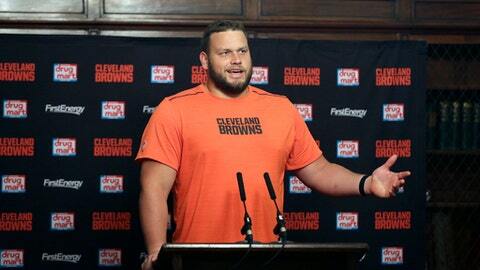 The 6-foot-4, 315-pound Bitonio has made 47 career NFL starts at left guard since the Browns drafted him in 2014. He played one year of left tackle in college at Nevada, but Bitonio said the new position is a new world. And while he’s willing to make the move, he’s also reluctant. On the edge, Bitonio will face taller, faster players in single-minded pursuit of the quarterback. Luckily, or unluckily for Bitonio, he’ll get to practice at his new position against speedy defensive end Myles Garrett, the No. 1 overall pick from last year. Jackson was pleased that Bitonio more than held his own against Garrett on Wednesday.